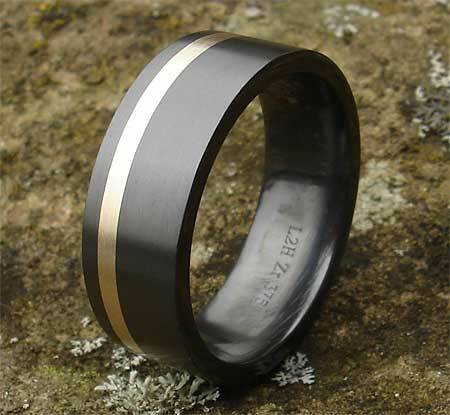 Men's Alternative Inlaid Wedding Ring : LOVE2HAVE in the UK! 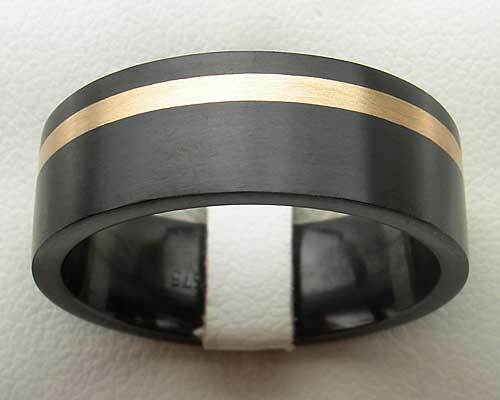 Here we have a men's alternative wedding ring, another of our UK made flat profile men's wedding rings with a gold inlay, but this time with an alternative option of being made from all black zirconium, something we know will appeal to men looking for a different ring. As pictured, the gold inlay sits slightly off centre towards one edge of the ring, and its width is 1.5mm. It is available in a choice of either 9ct yellow gold or 9ct white gold. 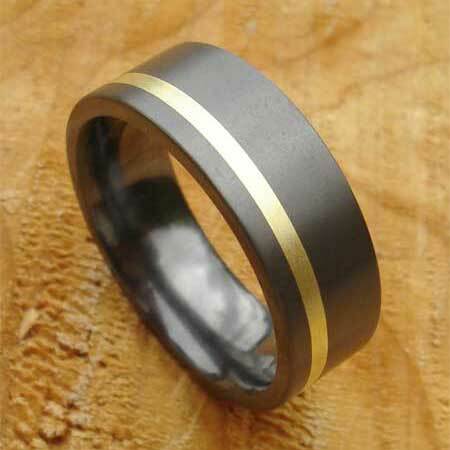 The yellow gold version is pictured here in a matte finish. Additionally, as well as the option of gold types are the widths available too, being 5mm and 8mm, and therefore making this particular ring choice suitable for an alternative wedding ring set. Incidentally, the inlays for both of these widths are 1.5mm. Finally, you have a selection of finishes available in polished or satin matte. Width(s) Available: 5mm and 8mm. Metal(s)/Material(s) Available: Zirconium and 9ct yellow or white gold.